I thought I’d do something new one my blog today, and share a bit of a review of a Warhammer kit I’ve been working with recently, largely because it was so damn impressive. Whether it becomes more of a feature will remain to be seen, but anyway! Let’s take a look at the Chaos Space Marines kit! I picked up the Horus Heresy boxset back when it was released, and after some vacillation, I’ve decided to paint them up as Alpha Legion, so after some thought, I picked up a box of these chaps to try out the colour scheme that I’d settled on. I’d been searching for a scheme that would be noticeably different to the Ultramarines that I have been planning for a few weeks now. After a series of blues, there was one that had the right kind of turquoise-y look that I wanted, so set to work assembling them. And my goodness, this kit is amazing! The equivalent of the Space Marine Tactical Squad, there are enough parts to make ten Chaos Marines, armed with a whole panoply of weapons that I actually find more exciting than the regular tacticals. The forces have Chaos have long interested me, but all the spiky bits have kinda put me off any of the models before now. Of course, there is a proliferation of such bits in this kit, but it really helps you get into the theme of the army you’re building. Speaking of army themes, the overriding theme here is Chaos Undivided, but there are some specialty bits to make unit champions that show their allegiance to each of the four Chaos gods, both heads, shoulder pads and banners. I’m doing Alpha Legion, who turned traitor to prevent the onset of Chaos (well, kinda…) so didn’t have need of these extra bits, but they look really great. The Tzeentch banner was a bit confusing to work out, which I suppose makes perfect sense, and the Nurgle bits are suitably disgusting. All in all, nice work. With chainswords and chaos bolters a plenty, there’s still time for some more specialty weapons, including a power sword, power fist, and heavy bolter. All in all, the package is tremendous, and as with a lot of multi-option kits from Games Workshop, the multiple poses you can achieve here really excite me. While perhaps not as amazing as the Lychguard kit, I still love the multitude of looks you can achieve with a unit. In terms of practicalities, there aren’t that many mouldlines to remove, even though this kit is getting on a bit now. The worst ones, for me, are on the bolters, but that’s kind-of to be expected. The most surprising thing, for me, was the instruction booklet. Unlike most modern multi-part kits, the sprues aren’t numbered, and the instructions almost assume you know exactly what you’re doing, and provide just general pointers. Granted, if you’ve built any multi-part plastic kit before, you’ll likely be fine. If you’ve built any space marine kits, or any of the new Stormcast Eternal kits, you’ll also be fine. Unlike those kits, the parts are ordered on the sprues so that paired arms appear together, for the most part. 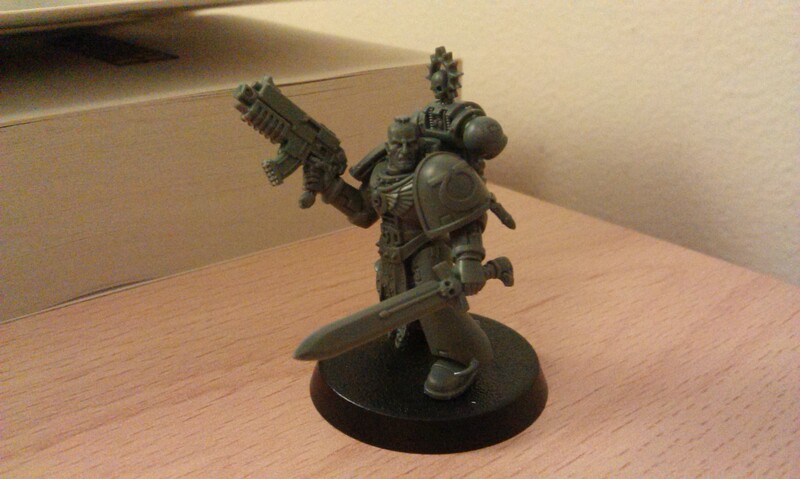 But there are some odd moments, particularly the right arm of the heavy bolter guy, that are very weird to sort out, and the poor quality of the instruction picture was no help whatsoever. Author spalanzPosted on November 28, 2015 November 29, 2015 Categories WarhammerTags Chaos Space Marines, Games Workshop, reviews, Warhammer 40k, Warhammer kits1 Comment on Time for Chaos! 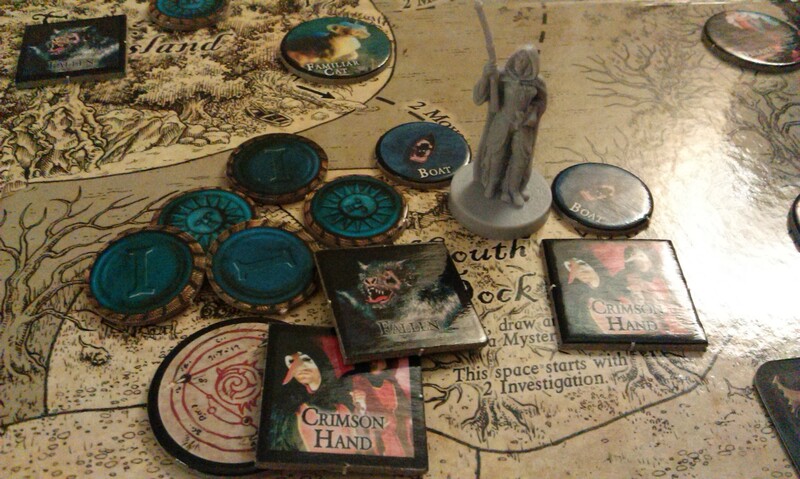 Tuesday is Game Day here at spalanz.com, and for today’s blog I’m taking a look at a game that has already come under the spotlight of awesome here: A Touch of Evil! I’ve been playing this game a lot recently with only the base game, something that I tend not to do with these kinds of games very much. And this is really what I thought I’d write about today. You can see all about the game in the earlier blog, where the mechanics are explained and whatnot. I’ve been really interesting in my own attitude to gaming lately, so I thought I’d explore this instead, and see where it goes. It might not end up being a very interesting blog, and I may not do many more like it, but let’s see, anyway! A Touch of Evil is a perfectly fine game in and of itself, and you can have a whole boat-load of fun without any expansions. However, I always find myself playing the game with at least one, and when I’ve played it without any in the past, I’ve always had something of a mediocre experience with it. I find this really interesting, and it got me thinking back to my very first games with it. 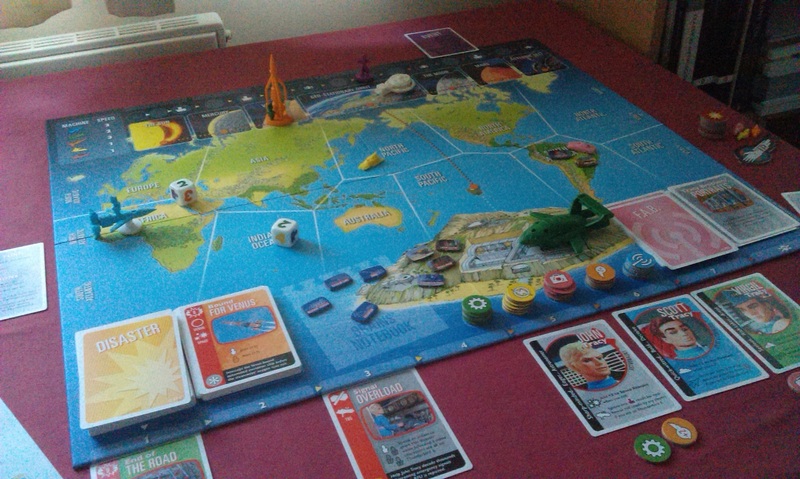 I was introduced to the game by an ex-girlfriend, and we played quite a lot of it (though she always preferred the same company’s Last Night on Earth). The fact that it can be played competitively or co-operatively, as well as the historical theme, has always greatly appealed to me. We bought it when it was new out, so obviously for a long time we could only play it with the base game, but we still did so, and we still enjoyed it. As expansions came out, we added them in, and always had a good time – but this is where the interesting thing (to me) comes in. Once Something Wicked had come out, we never went back to playing with just the base game. Even if we were using a base game villain, we’d still use the Echo Lake board. When I bought it for myself, I bought the entire line in one go, though still played the base game by itself at first, to get to grips with it once more. As I said, I’ve come back to just the base game a few times since, as well, but it has always felt a little lacklustre to do so. The game didn’t fundamentally change when Something Wicked was released. Sure, there were more mechanics going on, but the components of the base game are still the same as they were when it was released, so why should something that posed a decent challenge and provided lots of fun suddenly stop doing so? I suppose the obvious answer here is a change in my own skill level. As my familiarity with the base game increased, I could prepare and play accordingly. However, while this might be something of a knee-jerk response, I don’t feel that it really holds up to scrutiny. The fact that the game involves drawing from decks of cards and rolling dice means that any level of skill is mitigated by the high luck aspect. There are some location cards I’ve forgotten about because I haven’t encountered them all that regularly. There is too much random going on in this game to be able to properly assess the damage certain mystery cards can provide, meaning that almost any card is simultaneously both dreadful and an easy pass, depending on the game state right there and then. Strategy in such games all-too-often boils down to stock up on items and then go after the villain, even if it means paying 12 investigation for a lair card. Sure, there can be micro-strategies happening, such as always sending your female investigators to fight the succubus, but in the main, there’s not a lot else that can be done. However, if you’ve been reading this blog for any amount of time, you’re not only an amazing person, but you’ll know that I am a huge fan of thematic play, and I will rarely go into this game thinking “I’ll just stock up on stuff and then go in all-guns-blazing”. I like to explore the board, and even when I’m drawing seemingly random encounters, I like to see how I can weave these things into a narrative that is telling the story of the game. Immersing myself in the experience, I like the fact that I don’t get to fight the villain until the end (more often than not, at least!) as it lends an air of mystery to the game. I keep coming across packs of wolves, and what was that succubus all about at the covered bridge? Oh no, it’s a vampire! 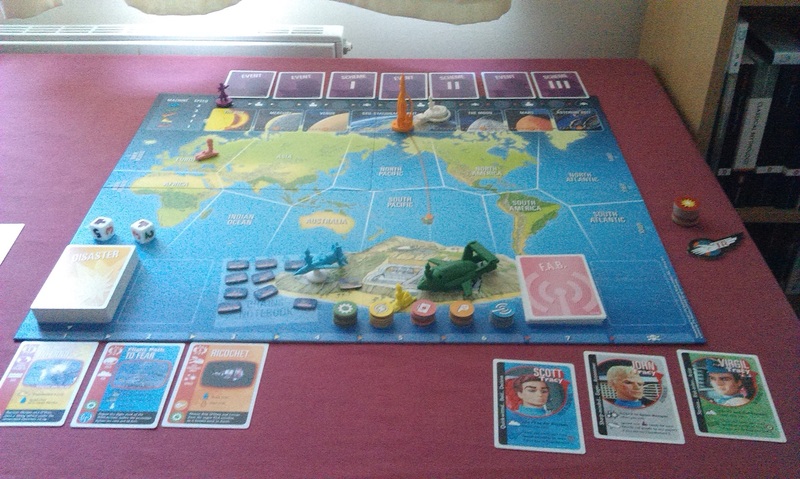 However, playing thematically will only take you so far, and I think the issue – for me, at least – is just that I’ve been spoilt by expansions. The base game for any game line will invariably give you a good, all-round experience of the game, but it won’t be particularly mind-boggling (at least, not anymore). It falls to the line of expansions to enrich the gameplay experience further, once you’ve been pulled in by the initial purchase and like the basic mechanics. 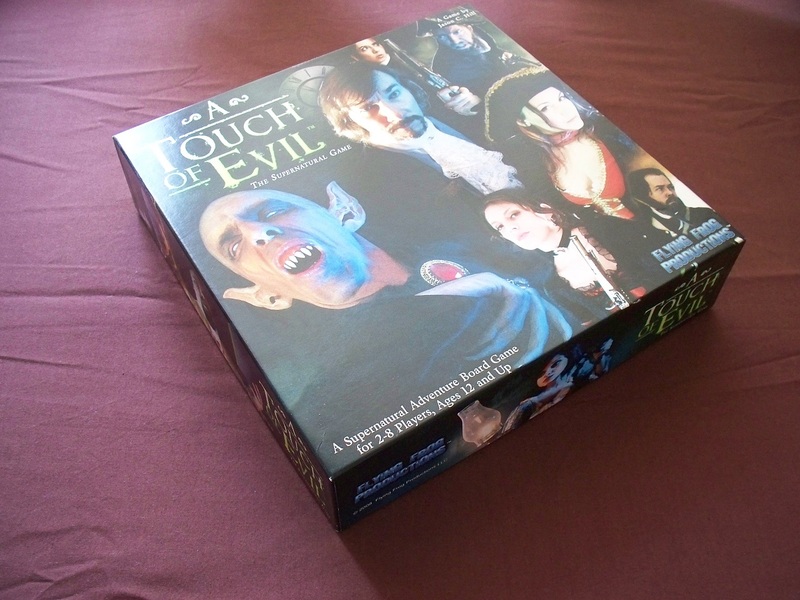 A Touch of Evil is no different to a whole host of other games in this regard, and I could have really picked any other game in my collection to write about in this sense. 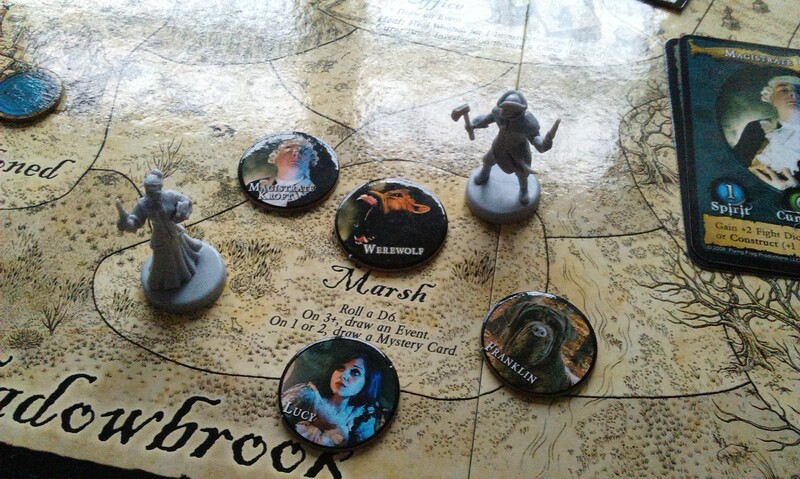 In the case of Something Wicked, we have more locations with complex encounters, we have more villains with more complex mechanics, the whole game is taken up a step by the addition of this board. If you add in The Coast, you’re in for the night with that game setup! However, once you’ve experienced that sort of craziness, by paring it back to the base game once again, I for one feel like I’m having a fairly basic experience, which I think is the crux of this entire issue here. Expansions aren’t always necessary, and can sometimes feel like a real train-wreck. Other times, expansions are necessary to the continued enjoyment of a game, but fail to deliver as they only provide a more-of-the-same feel. Yet other times, expansions add a whole new dimension to a game that makes them virtually inseparable to the main game. While I’ve always been a great lover of expansions, this has always stemmed from the fact that I like variety, and new ways to play a game, though I am opposed to expansions for the sake of it. A game like A Touch of Evil certainly falls into the category of needing more expansions, and those that we have for the game have served to enhance the experience immeasurably. You don’t need expansions to enjoy the game for what it is, but I feel you certainly need them to ensure you continue to enjoy the game. What about you? Can you play just a base game and enjoy it forever, or are you more of an expansion fiend? 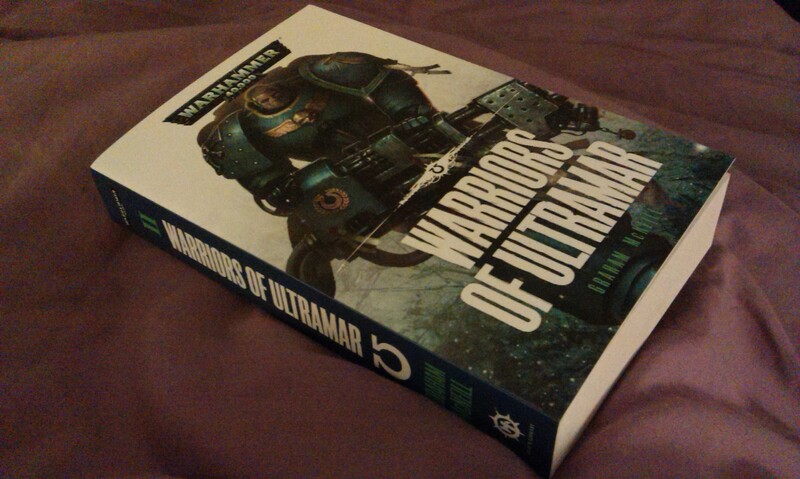 Warriors of Ultramar is the second installment in the Ultramarines series from Graham McNeill, following on from the events of Nightbringer a year previous. The Fourth Company, under the command of Captain Uriel Ventris, is tasked with defending the world of Tarsis Ultra from the threat of the tyranids, who have been felt in the area through the Shadow in the Warp. They join forces with one of their successor chapters, the Mortifactors, who present a wholly different way of behaving to the Ultramarines. This book is really good, though I have to say that one or two points do make it suffer somewhat. Perhaps most obviously, the Ultramarines are up against the tyranids, almost exclusively presented as unknowably alien in behaviour, and so we only really get one side of the story. The tyranid imperative to consume all biomass of each and every world they come across is well-known in Warhammer 40k lore, and McNeill does a good enough job of giving us certain insights into the race, through the introduction of Inquisitor Kryptmann and, later on, the lictor, but ultimately we have a very one-sided story. This may not bother you, and certainly going into it knowing they were facing the tyranids, I was prepared for it, but it can still feel a little flat overall. Secondly, there were a lot of sequences early on showing the people preparing to withstand the forces of the Great Devourer, which felt almost like some kind of stock footage. We see people barricade their homes, train to be better soldiers, etc etc, and it all feels a bit tired, somewhat. This isn’t really a third point, as it’s very much down to personal preference here, but there’s also a sub-plot featuring a street gang that I felt was almost wholly irrelevant. Of course, it allowed insight into how the fight was affecting the little people, but the characters weren’t particularly interesting, and overall I felt that the scenes could have been excised pretty easily with no loss to the overall shape. But that’s just me, of course! The story is actually really good, though, with so many moments that made me want to cheer and that had me in paroxysms of delight. Graham McNeill certainly has a cinematic writing style, and there were a whole bucket-load of set-piece action sequences that felt really visceral, not least among them the final mission into the heart of the hive ship. That was quite disgusting, but really quite exciting all the same! Of course, to some extent it served to almost humanize the tyranids, as we see their hive ships are basically living ships, but ships nonetheless, with holds and corridors and the like. It wasn’t quite what I was expecting, but it was perhaps a little too familiar to fit with the unknowably alien of the rest of the race. Overall, however, a solid adventure story and a definitely enjoyable read. Also included in here is the short story Leviathan, which shows our intrepid Fourth Company dealing with a space hulk that had been taken over by Orks. However, a more fearsome menace lurks in the shadows as, no sooner have the Orks been met in battle and defeated, than the Ultramarines are overtaken by a brood of genestealers! The story is a lot of fun, and I found it interesting to read about the Orks, even if only a little, as they’re a race I’ve not encountered a lot of in my 40k reading thus far. 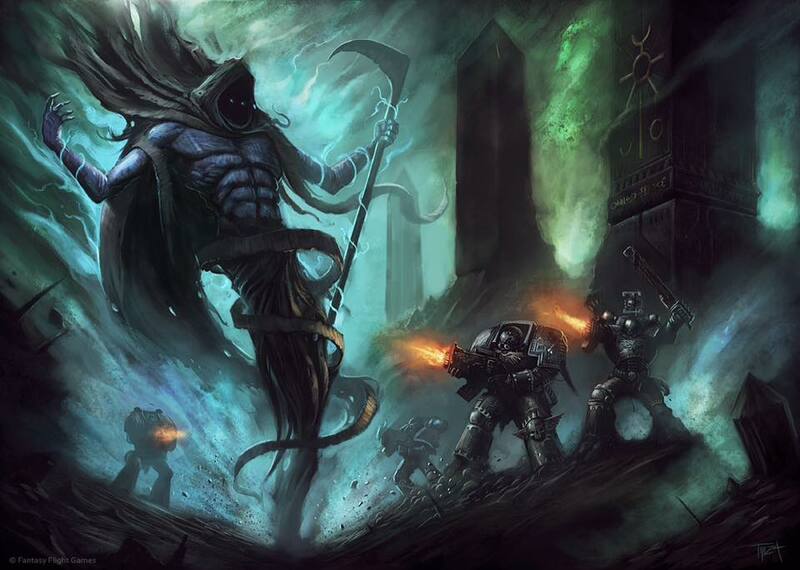 The story leads directly into Warriors of Ultramar as the astropaths report they can feel the Shadow in the Warp. Welcome to game day here at spalanz.com, where Tuesdays are brightened by the exploration of games from across my collection! 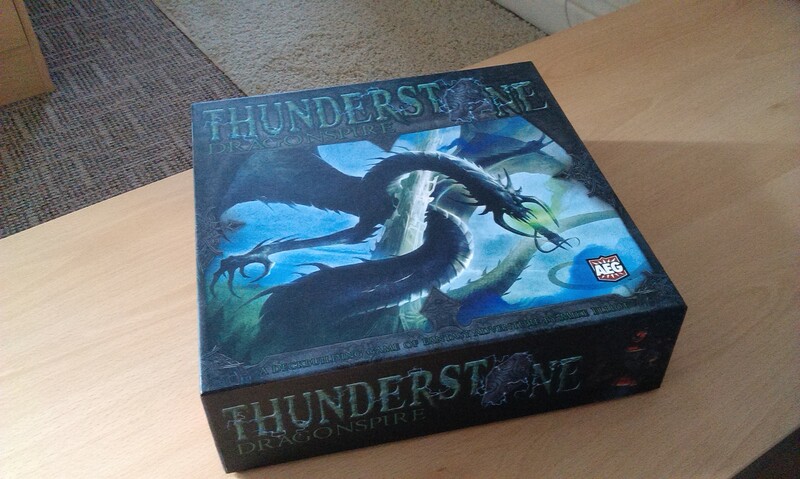 Today is the turn of what I think is the most expensive game I have ever bought, simply because I came to this on the aftermarket: it’s time to take a look at Thunderstone: Dragonspire! This is an expansion to the Thunderstone line from AEG, released back in 2011, but like many deck-building games, it functions as a second core set rather than simply an expansion. 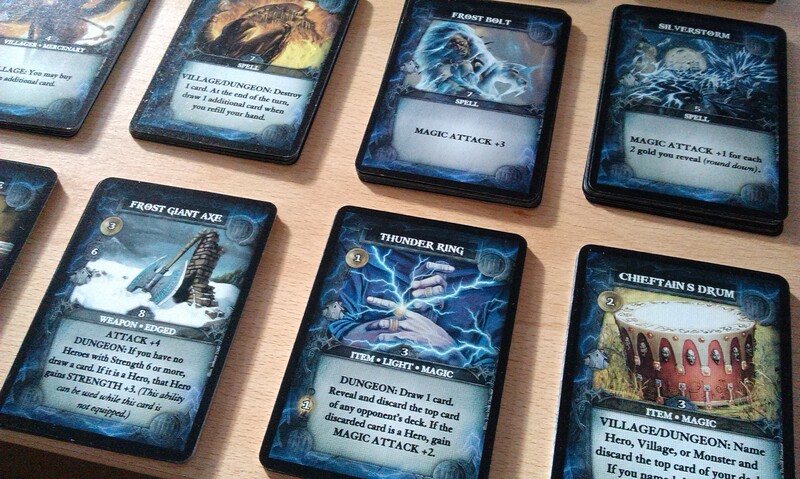 Despite the name Dragonspire, there aren’t all that many dragon cards in the game, which is a little odd – however, the second Promo Pack released for the game line features ‘dragon – humanoid’ monsters for the dungeon deck. Combined, these two games cost me nearly £200 to pick up back in 2012, which seems a bit ridiculous now, but being a completist I couldn’t really not have them in my collection! But were they worth it? There certainly are some interesting cards in this set, but I’m not so sure. Much like a lot of deck-building games of its type, it features just more of the same style cards. 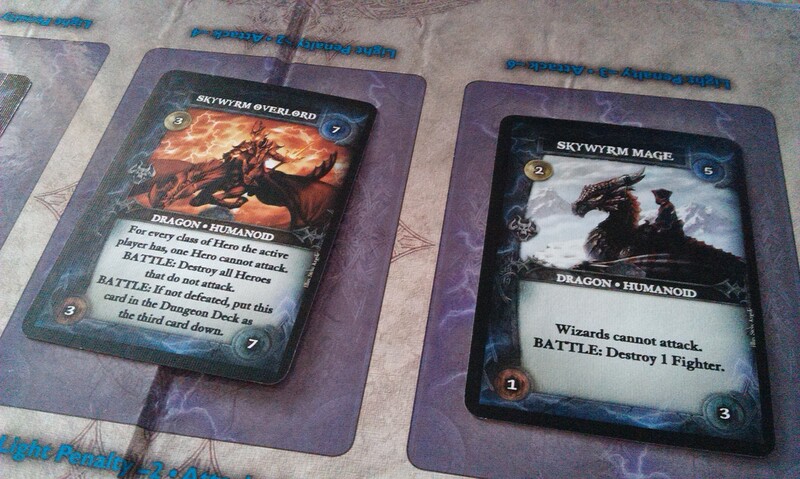 Unlike, for instance, Marvel Legendary, there isn’t really much of an over-arching theme for the set. The promo pack has some interesting cards, such as those shown above, but overall, I find some of the smaller expansions like Wrath of the Elements more enjoyable. Author spalanzPosted on November 17, 2015 November 16, 2015 Categories board gamesTags card games, deck-building games, expansions, game day, Thunderstone2 Comments on Here be dragons! So I’ve mostly spent the weekend fiddling around with little plastic men. I’ve had a whole multitude of projects on the go for a few weeks now – more Necrons and more Stormcast Eternals, along with my nascent Ultramarine force that I want to do a specific blog post on. I’ve had these Immortals on the go for a while, my second squad with the tesla. However, it’s just taken me so long to make any real move with them. Well, this weekend saw that begin to change, as I added the shade, then the gold/brass to the pauldrons, along with painting the heads. So some real progress here! 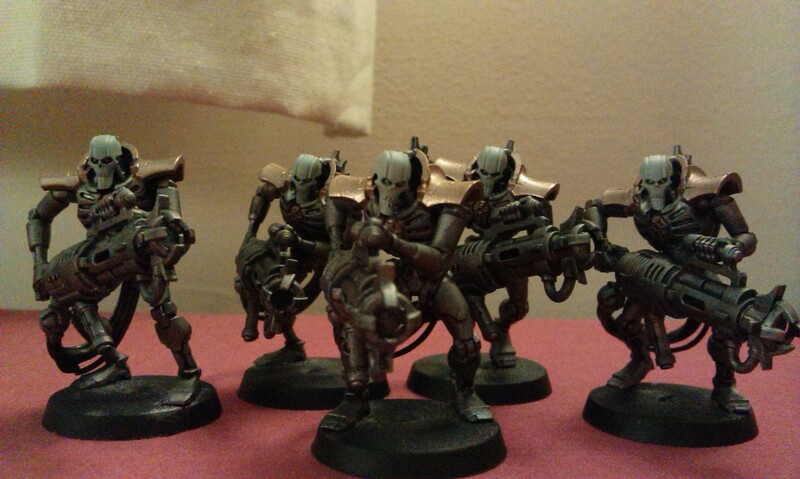 This squad of Lychguard is harkening back to my very first build for the Necron army. I built up a box, three with warscythes and two with the sword/shield look, then bought a second box to make up five of each weapon option. In doing so, I wanted to get at least one of the shield guys actually using his shield, but it didn’t really happen. This time, however, I’m hoping to produce something that will look like an actual shield wall once it’s done. As with the last batch of Necron Lychguard, I like the fact that I’ve managed to get what should turn out to be really dynamic poses from these chaps. Looking forward to getting these finished, anyway! On to Age of Sigmar! Well over a week ago, I returned to the Stormcast Eternals with the Paladins kit. Having already gotten three Retributors in the base game, I thought I’d go for the Decimators option, with massive axes that allow the miniature to make one attack against each model in an enemy unit within range. Sounds pretty badass, I have to say! I finally got to paint these up yesterday – basecoats and shade, at least. I tried to do something different with the head of the thunderaxe, mixing a different pigment into the leadbelcher base – in this case, temple guard blue. It looked too subtle at first, but I think I went too far with it in the second coat, so it looks a little weird right now. However, I think if I paint a layer of ironbreaker or something, then glaze it with Guilliman blue, it might still work as I want. Stay tuned! Finally, I’ve built up a second box of Paladins as a squad of Protectors. I love these glaive weapons, and the rules that allow you to deflect ranged attacks by creating a spinning web sound pretty cool. Whether it has any sort of practical application will remain to be seen, but you never know! 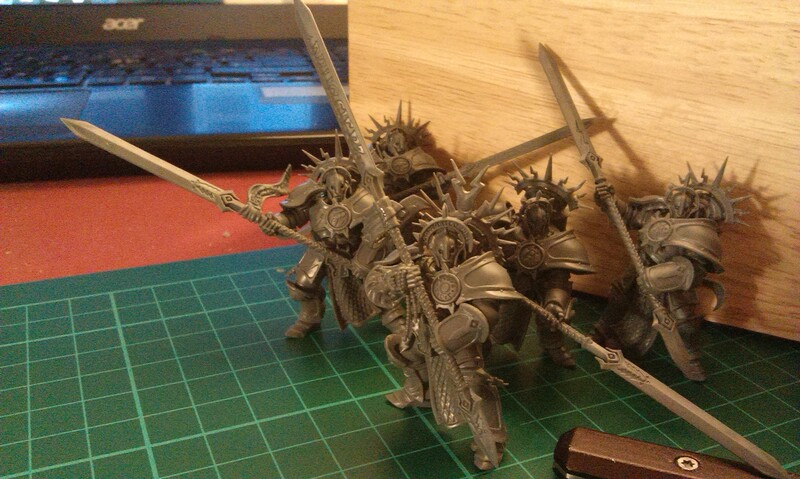 I feel a little overwhelmed still, by having my dining table pretty much covered in models in various stages of completion, but at the same time it was nice to have the Necrons on the go, then have the very different Stormcast Eternals to work on alongside them. So maybe having a variety of models on the go, while potentially overwhelming, could at the same time be pretty useful for keeping me motivated and whatnot. I also popped into my local GW store on Thursday and got talking about Age of Sigmar, which was really great as it seems there is a fairly devoted player-base in the store. 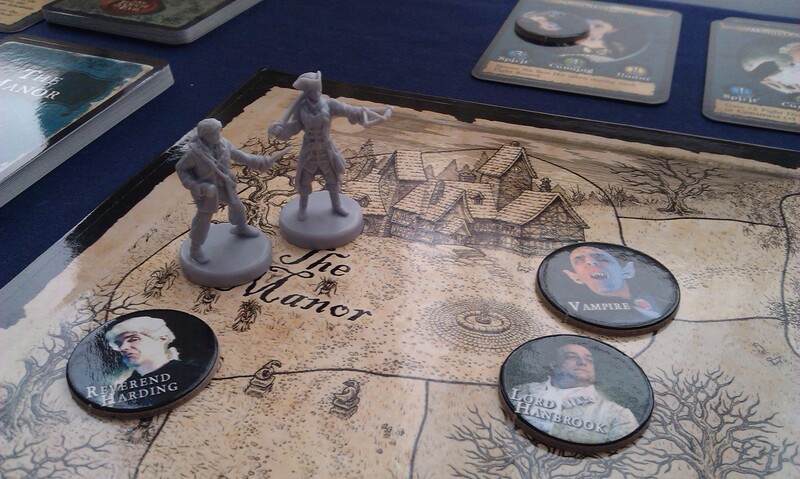 Even better, it’s a player-base that emphasizes thematic play rather than anything else. So I’m frantically (as much as anything I ever do can be described as “frantic”) trying to get more models finished so I can join in there! Finished this bad boy earlier this week – and let me tell you, it was amazing!!!!! I’ve been enjoying something of an Ultramarines kick lately, which may account for my unbridled enthusiasm of course, but even so! 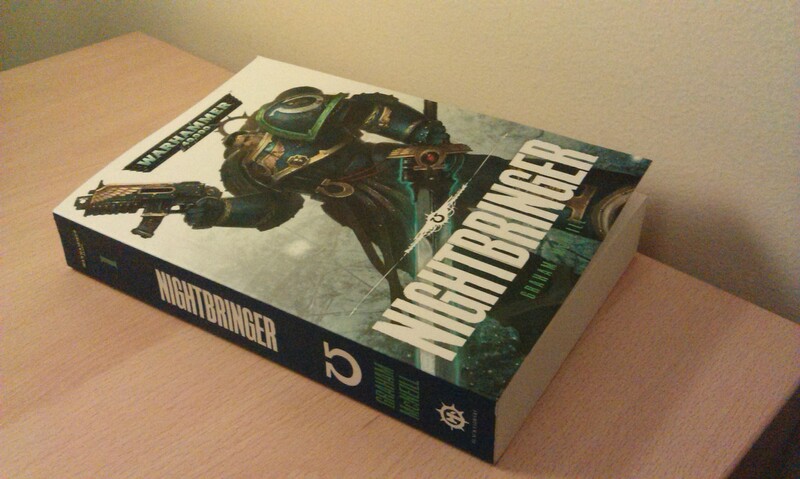 Nightbringer is the first in a series of six Ultramarines novels by Graham McNeill, author of the Dark Waters trilogy (among others). It follows the exploits of Captain Uriel Ventris of the Ultramarines Fourth Company, on a mission to the world of Pavonis to accompany the Administatorum adept Ario Barzano in his investigations there. The government of the planet is run by trade cartels, and the level of corruption is quickly exposed by the adept, while the Ultramarines follow the clues around a dark eldar raiding group with links to one of the cartels. I really, really loved this book! As I said at the beginning, my recent love for the Ultramarines brought me to it, but the book itself is actually a really great read. It has all the elements for a truly excellent adventure story, with loads of action as well as mystery and suspense. While the mystery was perhaps a little too fractured at times, it only means a second reading should be as rewarding as the first one, I imagine. There are several big action sequences in the book, but they don’t feel anywhere near as confused as some set-piece battles can read, which is another big plus for me. It was great to see the Ultramarines in action, and while Captain Ventris can be a little bland at times, the book doesn’t truly revolve around him, but rather Ario Barzano, who turns out to be an incredibly interesting character. The large ensemble cast is handled pretty well, and all in all I have to say, this book was a real pleasure. On to Warriors of Ultramar! Time for another game day blog, and today it’s time for a first impressions of a game I picked up a few weeks ago. 5-4-3-2-1 – Thunderbirds are go! 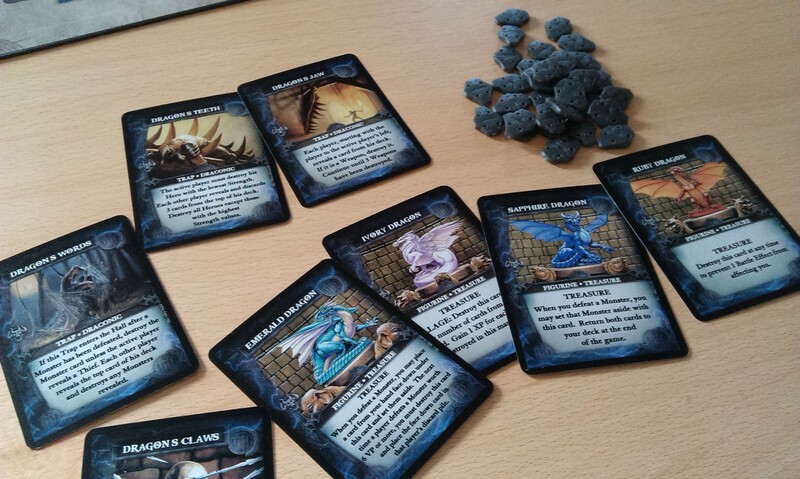 It’s the new co-operative game from Matt Leacock, funded via kickstarter earlier this year. I actually had no idea this game was happening, but walked into my local store last month and it was there for sale. The manager’s enthusiasm for the game was infectious, and within a day or two I’d bought it. However, I wasn’t really in any rush to play it until this weekend, despite the numerous jokes from him about buying games but not even taking the cellophane off. At any rate, I’ve had a proper chance to try this game now, so thought I’d come along with some first impressions for you all! This is part of something I’d like to do with this blog, anyway, in providing more structure to the game day blogs I keep churning out: during the month, I’d like to get at least one first impressions (though I guess that depends on whether I’ve tried any new games that month) and at least one really in-depth review, with the other blogs falling somewhere in between. Well, we’ll see how that goes. So Thunderbirds, for those of you who don’t know, is a British TV series from the 1960s, using marionettes to tell espionage-style rescue stories set in the 2060s. I remember the show from the repeats during the early 1990s, where my dad’s enthusiasm for the show prompted little 8-year-old me to take an interest. Ah, the memories! 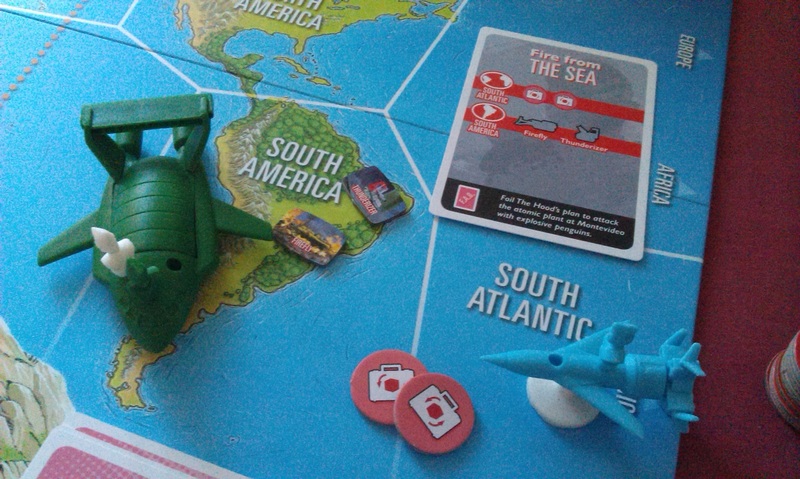 The game takes this idea of rescue missions as its basis, and features a Pandemic-style game-play as you have to both stop the evil machinations of the Hood while also performing rescue missions across the globe. 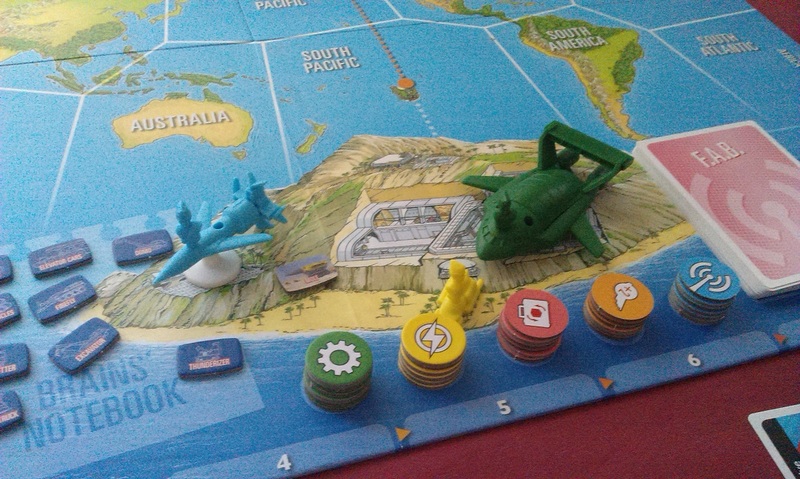 Other mechanics from Leacock’s previous games, notably Forbidden Island, also make an appearance. 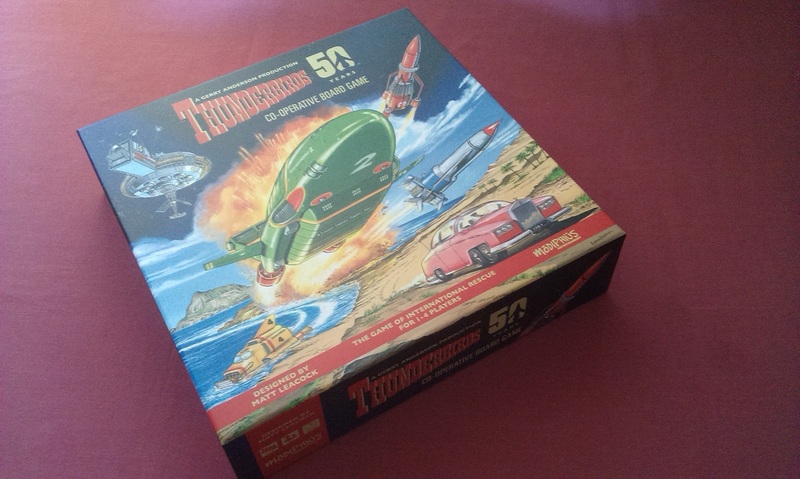 Players take the role of one of the five Tracy brothers, or Lady Penelope, and move around the board in the Thunderbird machines performing said rescues and foiling the Hood’s schemes. On your turn, you have four actions, and can also perform however many “operations” that you like. So you can move, rescue, take special actions, draw cards, and so on, but to facilitate certain actions, you have these operations, such as moving between vehicles on the same space, or defeating the sinister schemes. If you defeat all three Schemes before the Hood figure gets to the end of his track, then you win! If you fail to do this, or if you allow too many disasters to break out, then you lose. Something that, I have to admit, I found a little difficult at first was the fact that anyone can pilot any of the Thunderbird machines. I know it happened in the show, of course, but it still felt kinda wrong to have Virgil in Thunderbird 3 and John in Thunderbird 4, but it was something that I soon got over. I was also surprised at the level of planning needed to get this game moving. In order to perform rescues and avert the disasters, you need to be in a specific location and roll higher than the disaster’s number on two six-sided dice. It’s theoretically possible for any player to avert any disaster, as 9 seems to be the highest number to beat, while rolls of 10 are possible. 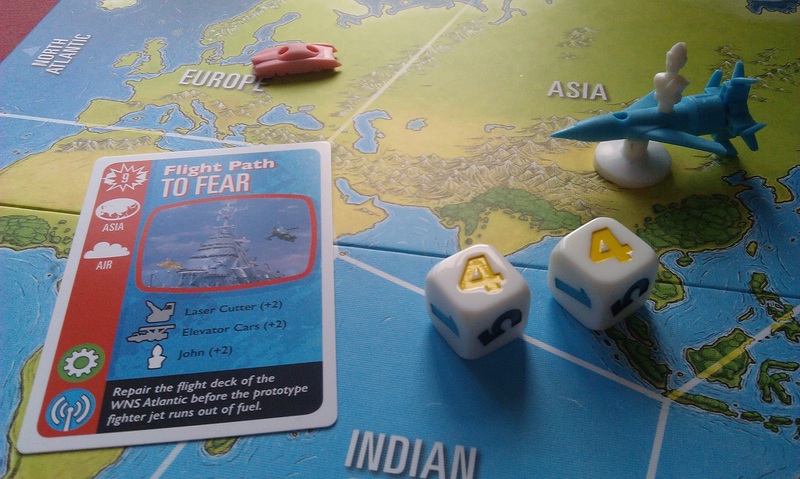 In the above example, John is piloting Thunderbird 1 in Asia, so he can use the +2 bonus listed on the card to lower the difficulty. Of course, if we’d been playing more efficiently, we’d have used Scott in Thunderbird 1 as well, as he has a +2 bonus to any air mission, as well as getting at least one of the pod vehicles on the scene. However, with a roll of 8, John alone was enough to avert this one! When you avert the disaster, you gain the bonuses shown on the lower-left corner of the card. These bonus tokens have a variety of uses, from allowing you to draw FAB cards (which provide useful, one-time bonuses and other events) to giving you extra actions or allowing you to construct pod vehicles to help in future disasters. They’re also required to stop the Hood’s schemes. The Hood track features a mixture of events and schemes, and when the Hood figure reaches a set point along the track, either the event will trigger – usually crippling player actions until something is done, such as discarding a bonus token – or the scheme will be completed. The Hood moves along the track whenever a player uses an action to draw a FAB card, or if the Hood is rolled on the dice. 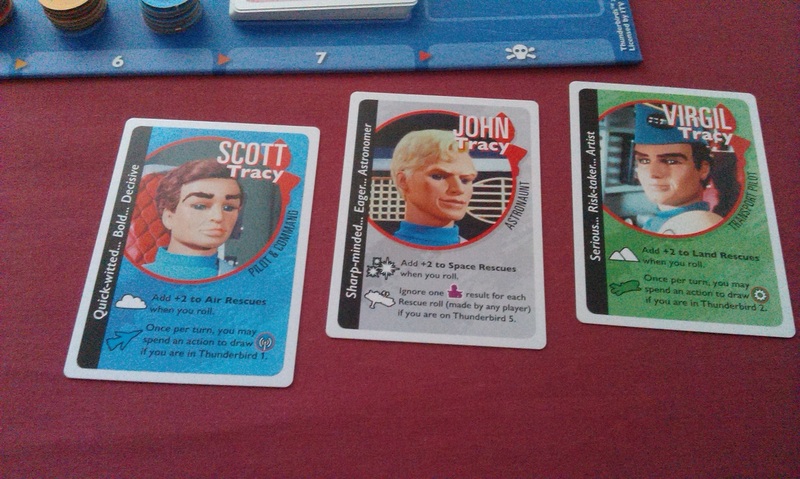 As it happened, in my first game the Hood barely moved at all, as John’s ability while in Thunderbird 5 prevents the latter from happening, and you can draw FAB cards through spending bonus tokens without any drawback. The schemes are numbered 1-4, and get progressively worse as you move through – from having to spend tokens in one place, to having to do two separate actions at progressively wider locations. It’s a great scaling mechanism, anyway! The game is a lot of fun, and requires a great deal of strategic thinking in terms of where you’re moving to all the time. A lot of the appeal of this game will come from the theme, so if you remember enjoying the TV series during any of its runs, you’ll likely get a lot more out of this than someone who is playing it as a rescue-style board game as-is. For me, it brought back a lot of memories (“Rick – ping! – O’Shea!”), and I had a real blast moving around the board trying to avert all these disasters. I also really like co-op games, so it has that going for it as well. If you liked Pandemic, or Forbidden Island, then you’ll probably like this one as well. Definitely worth picking up!